The Fall Commencement class included applicants for 1,052 bachelor’s degrees, 570 master’s degrees and 113 other degrees and certificates. 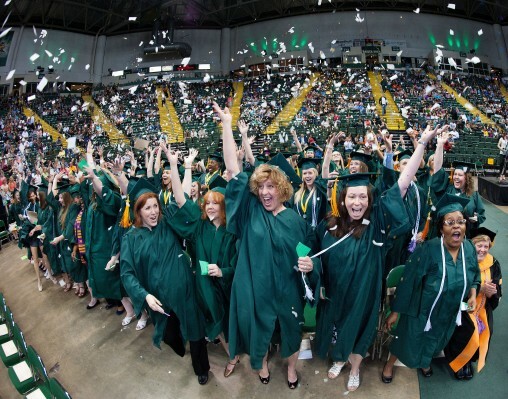 Wright State University President David R. Hopkins challenged graduates at the 2013 Fall Commencement to prove themselves “mentally strong” in the future. Mentally strong people do not waste time feeling sorry for themselves. Mentally strong people do not shy away from change. Mentally strong people do not waste energy on things they can’t control. Mentally strong people do not dwell on the past. Mentally strong people do not believe the world owes them something. The 1,735 students who had applied for degrees, certificates or endorsements celebrated their accomplishments during the Saturday morning ceremony at the Nutter Center. The Fall Commencement class included graduates ranging in age from 20 to 67, including 146 international students from 25 nations. The international graduates included natives of Burkina Faso, Ghana, Iran, Israel, Kenya, Nepal, Nigeria, Syria, Togo and Vietnam. The graduating class included applicants for 1,052 bachelor’s degrees, 570 master’s degrees and 113 other degrees and certificates. Saturday’s ceremony included recognition of faculty members K.T. Arasu (University Professor Award) and Joe Deer (Trustees’ Award for Faculty Excellence). ETHOS, an a cappella group made up of Wright State students, performed a musical selection. Many graduates have interesting stories to tell of their road to a degree. Two are profiled below. Grace Curell completed her associate degree with a 3.9 grade-point average, earned her liberal studies undergraduate degree from Wright State with a 3.8 GPA and compiled a 3.9 postgraduate GPA while finishing her MBA. Somehow, after earning a master’s degree by age 20, missing the high school prom doesn’t seem like such a big deal to Grace Curell. “I’ve had to grow up faster, but I’m glad for that,” Curell said. Curell fared well academically while in high school but felt “frustrated and bored” with the classroom atmosphere. She read The Economist during class, battled health issues and found herself more motivated to work with horses at Celebration Farm than to complete her homework. Prior to her junior year, Curell told her parents she wanted to drop out. The plan that unfolded over the next two years eventually included classes at Sinclair Community College through Ohio’s Postsecondary Enrollment Option, obtaining her GED, and enrolling in Sinclair classes that would translate to Wright State credits. Curell completed her associate degree with a 3.9 grade-point average, earned her liberal studies undergraduate degree from Wright State with a 3.8 GPA and compiled a 3.9 postgraduate GPA while finishing her MBA. Her bachelor’s degree was actually finished before her associate’s degree was completed. “I didn’t do anything normally,” Curell admitted. Doing things her way also led to quick job placement. Curell has been hired as a financial management analyst at Wright-Patterson Air Force Base. Debbie Garber began pursuing her Bachelor of Arts in Psychology in 2004, soon after being hired by the College of Science and Mathematics as administrative support coordinator for student services. Debbie Garber admits her “lifetime learner’s” journey to a college degree has been a long one, but a road well worth traveling. 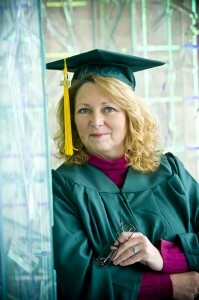 Garber began pursuing her Bachelor of Arts in Psychology in 2004, soon after being hired by the College of Science and Mathematics as administrative support coordinator for student services. But, first, she had to overcome her fear of math. The psychology classes came a little easier. People have always fascinated Garber, she said, and she wished to broaden her knowledge of human behavior. Garber limited her academic load to one or two classes per semester, allowing her to concentrate completely on those classes while also juggling work and family obligations. Her eventual reward was a college degree­–and a three-week family vacation to Europe.